It’s a mistake many people make when public speaking. You’re part of a program or a panel. You get up to speak and you can’t be heard, you’re too loud, the microphone, or mic, is too high or too low. To avoid being “caught by the mic,” arrive early and try to check microphone levels before the audience arrives. Then, try out the mic. Is the mic adjustable? Can you change the height and angle? If so, you’re in luck. If not, don’t worry. You will just have to compensate a bit. If the mic doesn’t adjust and you’re too tall, don’t stoop down to it. Try lowering you chin slightly as if speaking into the mic. If you’re short and the mic is too high, ask for a small platform that you can stand on. If one isn’t available, just stand as tall as you comfortably can, lift your chin, and speak up to the mic. Try out words with letters that “pop,” such as p, t and d. If the mic distorts, and sound levels can’t be adjusted, try standing slightly away from the mic. If you can’t be heard well, concentrate on talking to the back of the room to help you project better. Whether you’re short, tall, a loud or soft speaker, always pronounce your words clearly and support your voice. 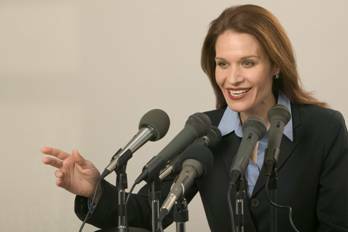 Our “Techniques for Effective Public Speaking” teaches you how to project and support your voice so that you always sound your best. Thanks for this reminder! I really get frustrated with speakers who can’t quite get the mic working–either it blasts or we can’t hear!